To respond to the Chinese State Council's Decision1 in May 2015 on cancelling the application and pre-approval process for claiming tax treaty benefits, the State Administration of Taxation (SAT) promulgated the Administrative Measures on Non-resident Taxpayers Claiming Tax Treaty Benefits (SAT Public Notice 2015 No. 60, PN 60) on 11 September with an effective date of 1 November 2015. The new Measures are to supersede the prevailing Guoshuifa  No. 124 (Circular 124). PN 60 introduces a new mechanism of self-assessment on the eligibility for tax treaty benefits (reduced taxation or exemption under the relevant tax treaties) by non-resident taxpayers. The pre-approval process or record-filing acknowledgement from the Chinese tax authorities is no longer necessary. Instead, non-resident taxpayers and their withholding agents will be required to file certain prescribed forms and other supporting documents when performing tax filing to justify their claims for the tax treaty benefits. As an important step to streamline tax administration, this cancellation of pre-approval process or record-filing acknowledgement from the Chinese tax authorities would certainly simplify the prevailing tax treaty benefits claiming procedures. However, the new self-assessment mechanism would demand not only the non-resident taxpayers but also their withholding agents to possess profound knowledge of the tax treaty and tax filing procedures to make an appropriate assessment. Furthermore, this new mechanism, essentially changing from pre-approval methodology to post-tax filing examinations by the Chinese tax authorities, would likely bring uncertainties and challenges to non-resident taxpayers. To mitigate the relevant tax risks of being challenged on treaty shopping or treaty abuse, non-resident taxpayers or their withholding agents should ensure proper documentation and preferably early communication with their in-charge tax bureaus, where possible. Circular 124 was promulgated in 2009 for the purpose of providing clear and unified procedural rules for non-resident taxpayers to claim tax treaty benefits. It set different procedures for the two different categories of income, namely the pre-approval process for passive income, and the record-filing acknowledgement for active income. Both procedures (pre-approval and acknowledgement) required the involvement of the Chinese tax authorities before the non-resident taxpayers could enjoy the tax treaty benefits, even though it was obvious that they were eligible. In May this year, following the mega trend of simplifying governmental administrative procedures, the Chinese State Council issued Guofa  No.271 and cancelled the pre-approval procedures for tax treaty benefits claims among other changes. Afterwards, the SAT started formulating PN 60 to replace Circular 124. 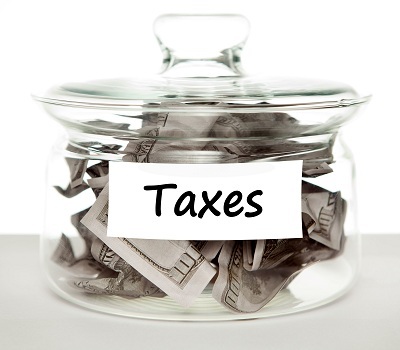 · Self-reporting by non-resident taxpayers: They shall perform self-assessment on their eligibility for tax treaty benefits while filing their tax returns. · Circumstances where the payer of that income is legally obliged to be the withholding agent or appointed as such: The withholding agent shall check whether the tax treaty benefits should apply according to the forms and documents provided by the non-resident taxpayers. In such case, however, PN 60 states that non-resident taxpayers shall remain the party responsible for the authenticity of the information and documents submitted to the Chinese tax authorities. Non-resident taxpayers and their withholding agents (if applicable) are required to provide a considerable amount of information in the prescribed forms and supporting documents and submit them to the Chinese tax authorities to substantiate the tax residency, types of income, and qualification (e.g. Beneficial Ownership) of the non-resident taxpayer for the tax treaty benefits. Among them, one noteworthy change is in relation to the provision of Hong Kong Tax Resident certificate (TRC). PN 60 has cancelled the SAT Public Notice 2013 No. 532 which effectively implies that a Hong Kong incorporated company can no longer rely on its certificate of incorporation to substantiate its Hong Kong tax residency status. Rather, it would need to provide a Hong Kong TRC to claim tax treaty benefits. Correspondingly, the requirement of obtaining a referral letter from the Chinese tax authorities for the purpose of applying a Hong Kong TRC would also be removed3. 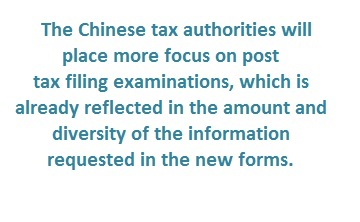 Following the cancellation of the pre-approval process and record filing acknowledgement in PN 60, the Chinese tax authorities will place more focus on post-tax filing examinations instead, which is already reflected in the amount and diversity of the information requested in the new forms. Apart from the information collection, PN 60 allows the Chinese tax authorities to request the non-resident taxpayers and their withholding agents to provide supplementary information in the examination process. Also, they may invoke the General Anti-Avoidance Rules (GAAR) in accordance with the relevant tax treaty provisions or domestic regulations to investigate the claims. Under such circumstances, the statutory limitation can be extended to as long as ten years. 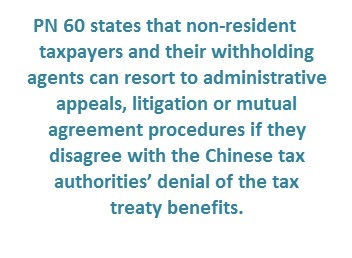 PN 60 states that non-resident taxpayers and their withholding agents can resort to administrative appeals, litigation, or mutual agreement procedures between the non-resident’s jurisdiction and China if they disagree with the Chinese tax authorities’ denial of the tax treaty benefits. Circular 124 provided a 3-year relief on repetitive applications for the same type of income following the approval of the first application. Under the new mechanism, PN 60 also sets certain rules to reduce the reporting burdens of non-resident taxpayers. As PN 60 has combined tax treaty benefits claim with tax filling, non-resident taxpayers and their withholding agents need to submit the prescribed forms together with the tax returns each time they perform tax filing. However, the requirement for submitting the supporting documents (such as the TRC) may be waived by the tax authorities for a certain period of time depending on the category of income in order to reduce repetitive submission. Under the previous Circular 124 regime, although the record-filing acknowledgement (without application or pre-approval process) was applied on active income, some local-level tax bureaus still require the claim to be subjected to their thorough examinations before the non-resident taxpayer could enjoy the tax treaty benefits. Therefore, it is important to see how PN 60 will be implemented at the local levels after the removal of the procedures. Besides, the removal of pre-approval procedures in tax treaty benefits claim is closely related to the revamping of outward payment remittance procedures. It is understood that China is relaxing its forex administration and the filing procedure prescribed in the Public Notice  No.404 on outward payment remittance may be abolished in the near future. It is anticipated that the payer (withholding agent) will be able to repatriate China-sourced income to the non-resident taxpayer in a more efficient timeframe following this abolishment. PN 60 introduces a new mechanism to bring about convenience and efficiency in granting tax treaty benefits and thus speeding up the repatriation of funds, which non-resident taxpayers should welcome. However, such positive impact comes with greater responsibilities and uncertainties on the part of non-resident taxpayers and even their withholding agents which should not be neglected. From the perspectives of non-resident taxpayers, given the complexity of the prescribed forms and the intrinsic difficulty in assessing the tax position, they should possess profound knowledge of the tax treaty and tax filing procedures to make an appropriate assessment. Also, as they are not able to get certainty from the Chinese tax authorities in advance like in the past, proper documentation and early communication with the in-charge tax bureaus are advisable in order to avoid potential controversies after their claims. Furthermore, they should have an overall understanding of their business arrangements and investment structures as this is essential to secure tax treaty benefits with a reasonable business purpose and sound business substance. PN 60 is silent on the legal consequences for the non-resident taxpayers and their withholding agents if their tax treaty benefits claims are denied by the tax authorities in post-tax filing examinations. However, in accordance with the China Tax Collection and Administrative Law (TCAL) and Corporate Income Tax Law, the non-resident taxpayer will be subjected to late payment surcharge, interest and/or penalty on the tax underpaid, depending on the reasons for the denial of the claim. For the withholding agent, if it fails to perform its assessment as prescribed or commits errors in the assessment which results in the tax treaty benefits being claimed mistakenly, it may also be liable to the legal liability stipulated in the TCAL5. To circumvent the obligations or to mitigate the compliance burden imposed by PN 60, we anticipate that some of the withholding agents may withhold taxes at the domestic tax rates and leave it to the non-resident taxpayers to apply for the tax refund, especially in circumstances where the withholding agent and the non-resident taxpayer hold different views. 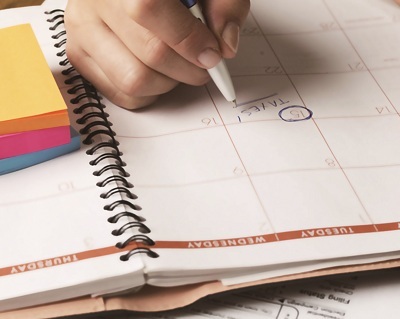 Although the non-resident taxpayer may apply for tax refund within the 3-year time frame stipulated in the TCAL, the application process for tax refund is generally challenging and time-consuming in China. 1. For more details of Guofa  No. 27 , please refer to our News Flash 2015 Issue 23. 2. For more details of Public Notice 2013 No. 53, please refer to our News Flash 2013 Issue 25. 3. Please refer to our upcoming News Flash 2015 No. 41 which addresses this issue in detail. 4. For more details of Public Notice 2013 No.40, please refer to our News Flash 2013 Issue 18. 5. A penalty ranging from 50% to 300% of the amount of the taxes shall be paid depending on the facts and circumstances.